Using a dry snorkel is a rising trend for both experienced and novice snorkelers. The current models for new snorkeling technologies for 2019 is still emerging. We believe many divers will opt for them over the traditional models. How Does a Dry Snorkel Work? 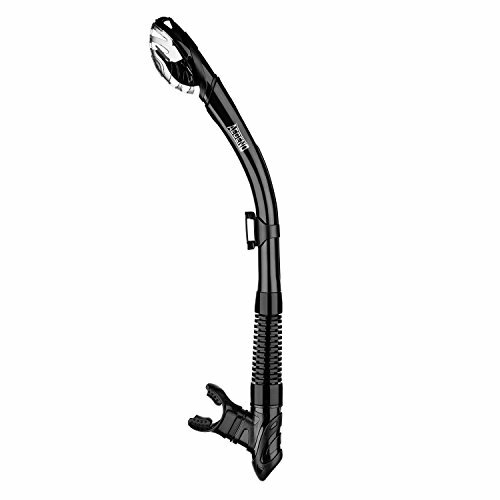 There is a lot of aqua sports brands and models out in the market today, amongst those the Cressi Supernova Dry is considered one of the best snorkels ever made. 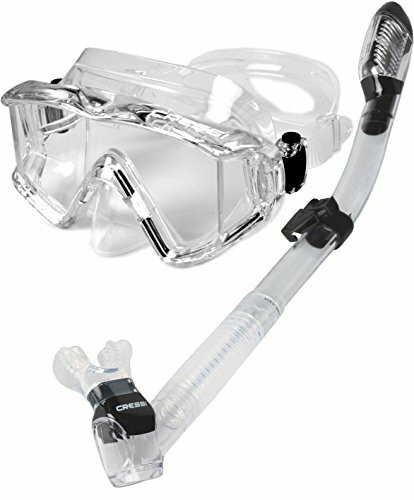 It has been retrofitted with features that provide the snorkeler easy and comfortable breathing while in surface water. Starting with the splash guard located on the top, it is embedded with a floatation mechanism that closes the one-way valve when it is flooded with water. This feature is essential especially in cases of accidental flooding or while you are underwater. Many of scuba divers and snorkelers alike said that they have appreciated this feature and do not need to blow and clear the tube after surfacing from a free dive. Another feature that is deemed necessary when draining the accidental entry of water is the water collection well. This is a large elliptical valve that collects and contains water that has entered the tube where a single blow of air can quickly and completely expel all the water inside the tube. This feature is very significant since old models require multiple blows and clearing, and in most cases, a small amount of water is left inside the tube thereby interfering with your breathing. 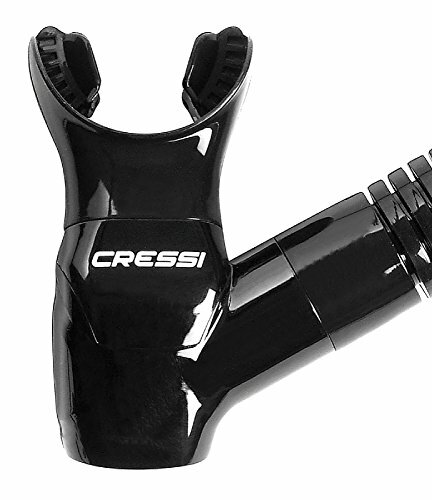 The lower part of the tube in the Cressi Supernova Dry is composed of a corrugated silicone material. It easily bends towards your mouth when you use the unit. However, when not in use, the silicone part of the tube goes back to its original position giving ample space when switching to the 2nd stage regulator from your scuba equipment. Many snorkelers have shared their stories that it is often time consuming when attaching and detaching your snorkel from the mask. Old types use circular rubber bands making it hard and rigid to attach, especially if the rubbers are dry. That’s the reason why snorkel keepers were developed to answer this time-consuming problem. However, with Cressi Supernova Dry, this is completely addressed courtesy from its quick release snorkel keeper. All you need to do is just attach one end of the keeper to your mask and clipping the other end of the keeper will securely fasten the snorkel unit while a single press of the quick release mechanism will completely detach the unit from the mask. This quick release feature is highly appreciated especially during the process of packing, equipment assembly, equipment disassembly, and unpacking. When we go snorkeling or free diving, it is inevitable that water will come inside the tube especially if the water is a bit choppy or when you decide to go underwater. This is relatively true for old models where its simple design is just composed of a plastic hollow tube that is bent in a J-shape on one end towards the mouthpiece. This is the reason why most old snorkel models are called the J-Type. When water comes inside the J-type tube, it goes directly near the mouthpiece. With this, you need to exhale and blow from your mouth for the water to come out of the tube. Otherwise, if you do not clear it, instead of breathing in fresh air, you will be swallowing in water. You have to remember that the degree of resistance to clearing the water inside the tube is directly proportional to the amount of water that comes in. This simply means that you need to clear and blow hard if there is a lot of water coming in. Well, things have changed, and snorkeling equipment has its own evolution where J-type is a thing of the past. Let's take a look at the transition of snorkeling tubes now - First of its remake is the Flexi-Purge model. Compared to the rigid plastic tube structure of the J-type, the Flexi-purge has a flexible silicone at the end before it attaches to the mouthpiece. This makes both breathing and clearing less resistant since the silicone tube is highly elastic and flexible. Further, it has a purge valve at the bottom portion of the mouthpiece. This means that when you clear the tube, water will exit at the purge valve requiring less effort to clear since water does not need to exit at the other end of the tube, just like with J-type snorkels. 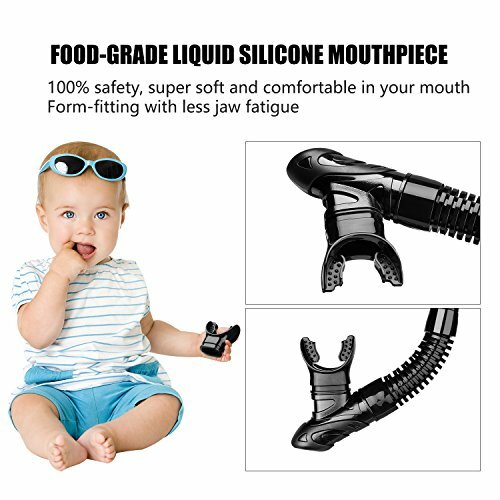 Securing the mouthpiece in your mouth is relatively comfortable when using the Flexi-type since it is primarily made of silicone rubber which only requires a gentle grip and generally has a comfortable feel when compared to its older counterparts. But evolution of the equipment did not stop at the flexi-type. Designers thought that mitigating the entry of water at the entrance hole of the tube itself would significantly affect its performance. And voila, they have come up with the Semi-Dry models. 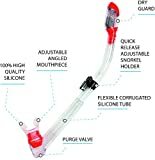 Basically, it looks and has all the components of the Flexi-purge snorkel, except that the entrance of the tube has a one-way slit that allows some the water to go out instead of directly entering the tube. This development has significantly reduced the amount of water that can potentially flood your snorkeling equipment. Further experimentation continues with the invent of integrated dry snorkel and mask sets, and then to full face snorkel masks, as in here. Most of the long standing brands as Cressi, Oceanic and others are switching to new technologies in their gear sets indeed. Comparing dry snorkel vs semidry ( also referred as vs wet snorkel) , this was made possible by the conversion of the one-way water slit into full-blown drain valve and is often called the splash guard Instead of coming in to the tube, water is directed to the drain valve making the entire tube completely dried thereby making your breathing process while at surface water a lot more comfortable and easier. And just in case a small amount of comes in, it can easily be cleared and drained courtesy from the enhanced purge valves at the bottom. In short, the only time that your dry snorkel will be completely flooded is when you opt to go freediving and choose to go underwater. 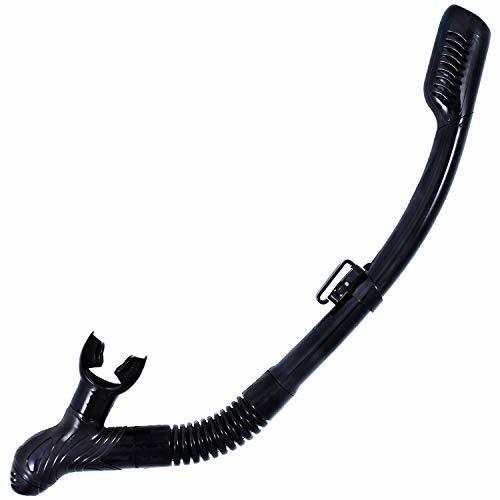 But do not worry, a fully flooded snorkel tube can easily be cleared and drained with just a single blow of air.